Fitness - I came to a startling realization yesterday. I joined SuperBetter yesterday (awesome game designed to help you improve yourself in the physical, mental, emotional and social aspects of your life), and one of the first quests in my own personal challenge (weight loss) was to consider and answer the question, "What is it like to be overweight?" As I was thinking and writing my answer to this question, it occurred to me that the reason I get so frustrated with weight loss efforts and keep giving up is that some part of me expects it to be like winning the lottery. I work hard for a little bit, and then BOOM. Windfall. Only weight loss doesn't work that way. Heck, it doesn't even work like my regular paycheque. Where I show up every day, do my thing, and get a regular payoff. No, weight loss is more like panhandling. I get a few pennies here and there, and eventually head to the shelter for a free lunch because I'm not getting anywhere. Now I need to figure out what to do with this information. This pattern has seen such an upsurge in popularity recently, and it's not hard to see why. It's gorgeous! And it's such an easy knit, you could practically do it with your eyes closed. I'm knitting it out of Tilli Thomas Raw Silk in Bok Choy. Sadly, this yarn is discontinued. I had gotten it at a significant discount at Log Cabin Yarns a number of years ago because some workman fell through Nancy's ceiling from the attic above and the basket of yarn was full of insulation bits. It is so lovely to knit with. It feels like crushed velour in your fingers, and it knits up beautifully! Unfortunately, since I was sick as a dog on Monday (too sick to knit - imagine!) and had both work and school yesterday, the shawl is still only about 75% done. I haven't had a chance to give it the final push to finish it. Hopefully I'll finish it before Friday so I can borrow Kari or Sue's blocking wires! Food - Not much to report. I meant to get the applesauce done on Monday, but I figured that cooking while I could barely stand up was probably not a good idea. It'll either get done Thursday night or on Saturday. I want to can it properly so I'll have applesauce for the next several months. I'm also planning on trying to make some spiced cranberry jam, but I also have to finish cleaning the kitchen for Rob's visit next weekend, so I'm not sure how much time I'll have. I definitely don't have to buy meat when I go for groceries tonight. I opened the freezer earlier to see three packages of stewing beef, some minute steaks, three whole chickens, a duck, two hams and a few sausages staring at me! I think there is Matzo Ball Soup in my future next weekend :) I have beef stir-fry strips thawing in my fridge for dinner tonight. I do need to buy some greens though. I'm craving them, and I've learned to listen to my body's cravings when I'm actually craving healthy stuff. School - wups... I had the first part of an assignment due yesterday, and because of the fog brain on Monday, I had too much to get done at work yesterday to finish it. Not a big deal, it's just one component of the main project that's due at the end of the semester, but I was hoping to have it in on time. Now that I have a clearer picture of what I'm looking at, I'll get it to him in the next day or two. Can't wait to see your finished version! I would love to give this shawl a go... I've saved the pattern. 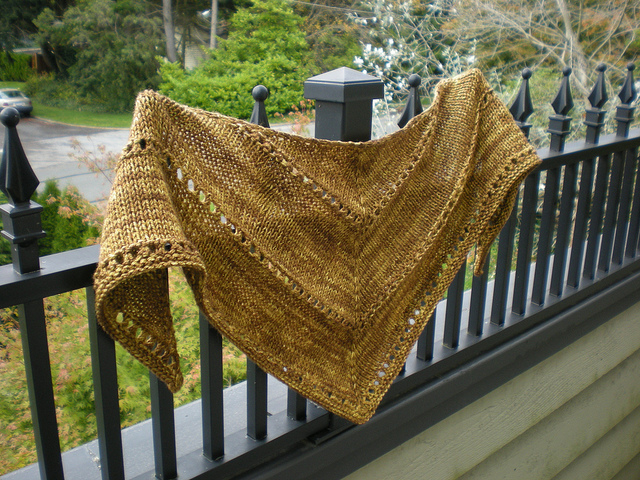 I'm also exited to see your finished shawl. I think it's perfectly acceptable to skip out on exercise if it is for the reason that you're sore from another type of exercise! No need to wear yourself completely out just for the sake of consistency.